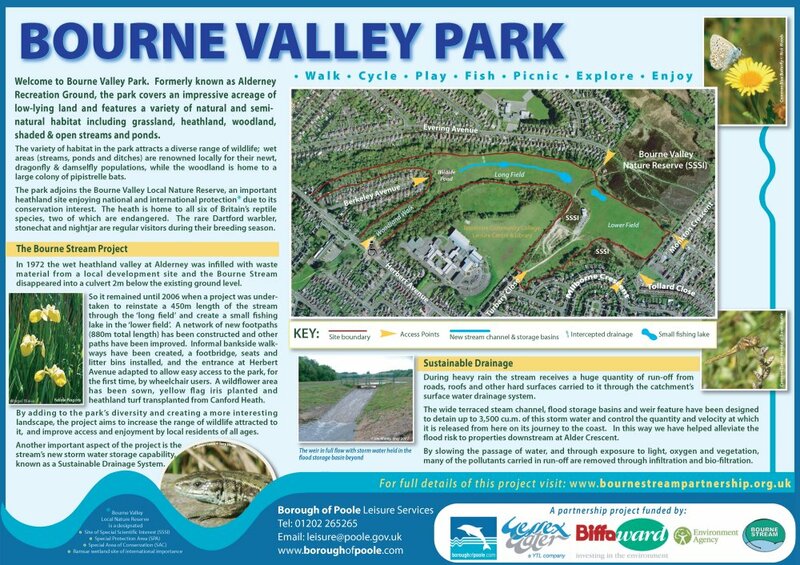 Bourne Valley Park in Alderney (formerly known as Alderney Recreation Ground) is a significant 15 hectare urban open space owned by Borough of Poole and cared for by the Council's Leisure Services unit. Previously covered in football pitches and managed as sports fields, the site occupies low-lying land and comprised a variety of habitats including areas of open grassland, heathland, woodland, ditches and a pond. The park lies immediately south east of the Bourne Valley Local Nature Reserve, a nationally and internationally important heathland SSSI, SPA, SAC and Ramsar site [more]. Alderney is Poole's second most densely populated area with 31 people to hectare of land (the Poole average is 21 people/hectare) and suffers higher than average levels of poverty, illiteracy, crime and anti-social behaviour. Potentially the park serves the recreational requirements of 9,250 people who live within a 1.2km walk of it. Three schools fall within the same threshold distance (one borders the park) attended by more than 1,500 pupils. In 2003, however, it was rarely used, the football pitches were too boggy for use and the Pavilion had been abandoned to graffiti and sporadic vandalism. Dog walkers were plagued by motorcycle users and the maintenance regime failed to make the most of what could have been a site of nature conservation interest. Since 2004 a number of Councillors, residents, agencies and other groups have joined together to improve the quality of life in Alderney. The Bourne Stream Partnership is one of those groups, and in 2007 completed a project to increase use and enjoyment of the park, while meeting its own objectives. It has been the most extensive and exciting project ever undertaken by the Partnership.